Size of Male: 4-7 lbs., 8-11 in. Size of Female: 4-7 lbs., 8-11 in. The Japanese Chin dog is a tiny, loving, smart and happy little dog whose only purpose is to be your companion. Also known as a Japanese Spaniel, they are loaded with sensitivity and a dainty physique and they demand plenty of tender loving care. Most dogs have Buddha’s “thumb print” – a differently colored hair patch located in the middle of the forehead. Japan is the source of the breed’s popularity but sources indicate that the Japanese Chin may be of Korean or Chinese descent. A Buddhist monk reportedly gave the early pooch to a Korean prince way back in 520 A.D. Two centuries later, the Chinese received the dog as a diplomatic gift and they in turn presented the breed to Japanese rulers. Unlike another popular Japanese breed, the Shiba Inu, the Chins in Japan are associated with nobility. The pooches occupied no other place but the palace where they functioned as ornaments and as lap dogs. They were accorded the same royal welcome by Queen Victoria in 1853. Today, the Japanese Chin dog expects to be treated no less royaly. More cat-like, quiet and well-behaved than the regular lot, this Japanese Spaniel sports a blend of playful and melancholy disposition. They actually tend to mimic the atmosphere that your household creates and fare best in a cheerful home. Harsh rebukes can easily dampen their good mood. In house parties, the Chin stands out as a gracious host. It digs attention! Living Environment – Be certain your home is equipped with a heater and an air conditioner. You’re going to need both while making your Chin comfortable because the indoor cutie cannot tolerate temperature extremes. A yard may not be necessary, but if you have one it must secure with an unscalable fence. Grooming – The silky coat of a Chin requires less grooming than you would expect. Bi-weekly brushings are often enough to prevent matting and to maintain luster. Remember to trim the bottom hairs to a “hygienic” length and inspect the undercoat for any allergies. The dog sheds all year round, so vacuuming may very well become a way of life. Diet & Exercise – Due to a tendency toward dog allergies, experts recommend that you omit the following from the Chin’s diet: corn, beef, white potatoes and horsemeat. Serving high-quality kibble is strongly suggested, especially formulas that use fish, chicken and pork as base proteins. You may also have to pick out brands with high fat content to nourish the dog’s coat. This dog breed’s exercise needs are very minimal and do not even qualify as a daily ritual. Short-distance walks and indoor games will suffice. It helps to visualize the Chin dog breed as cats in this respect. Health – The sedentary pooches are predisposed to a number of conditions including corneal abrasions, heart murmurs, luxating patella, hypoglycemia and epilepsy. They are also prone to contracting dog allergies and require round-the-clock health monitoring. Training should generally be a breeze. 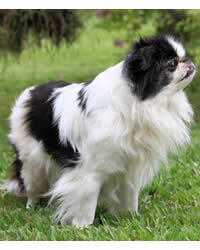 Japanese Chin dogs are intelligent, polite, obedient and eager to please. They respond positively to gentle methods and are quite delightful trick performers. For optimal results, start with basic obedience before anything else. My Chin's name in AnnyBelle. We just call her Anny.